Brief Synopsis: New heroes are arriving in the world. Issue Notes: Booster begins to lose his grip on top of the world. Story Notes: Like most issues of 52, this week's story title, "Thief," can apply to a majority of the storylines within the book. In Booster Gold's case, it applies to Supernova stealing the glory and admiration of the citizens of Metropolis from Booster Gold. FASHION ALERT: "Week 8, Day 3." This is the 52nd day of the events of 52 and features the first appearance of Supernova, a new hero in Metropolis. 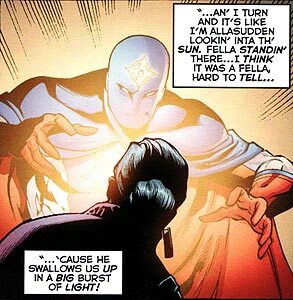 Supernova displays powers of teleportation as he saves citizens from a number of natural disasters. Supernova's costume is somewhat similar in design, though not color, to the costume that Superman once wore when he was temporarily the powerless crime-fighter named Nova (in 1968's World's Finest Comics #178). Boosterrific Review: The first hints of the mysterious new Supernova. A disgraced Booster Gold. Clearly the fight for the heart of Metropolis' citizens is just beginning. It is particularly impressive that the writers of this series work together so well as to create themes for each of these stand alone issues that still allow for the intertwining of the tales of disparate heroes. The theme of misunderstanding and jealousy in the Booster Gold vs Supernova story is mirrored in the situation of Steel vs his niece, Natasha, and the dialogue of Green Arrow. 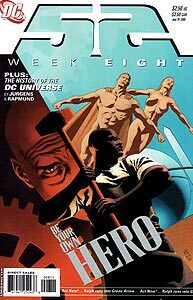 Each week, 52 manages to be something more than just another episodic soap opera as so many comic books published on a much more relaxed schedule are. Congratulations are due to everyone involved at DC for what they have been able to achieve.